Standard - $41.99 Only 6 left! The name. It's the most important thing. When you get a puppet, you must give it a name! You must measure its overall character and think of something that suits it. That's why we gave our Folkmanis Fluffy Cat Puppet the dignified name, Mr. Whiskers Fluffy Snugglesworth III... Esq. It suits him perfectly, doesn't it? He's one part fluffy, one part opulent, and he's all parts adorable. His favorite pastime is meowing loudly because his food bowl is only half full, instead of completely full. His second favorite pastime is knocking over errant objects that have been left on the kitchen table! 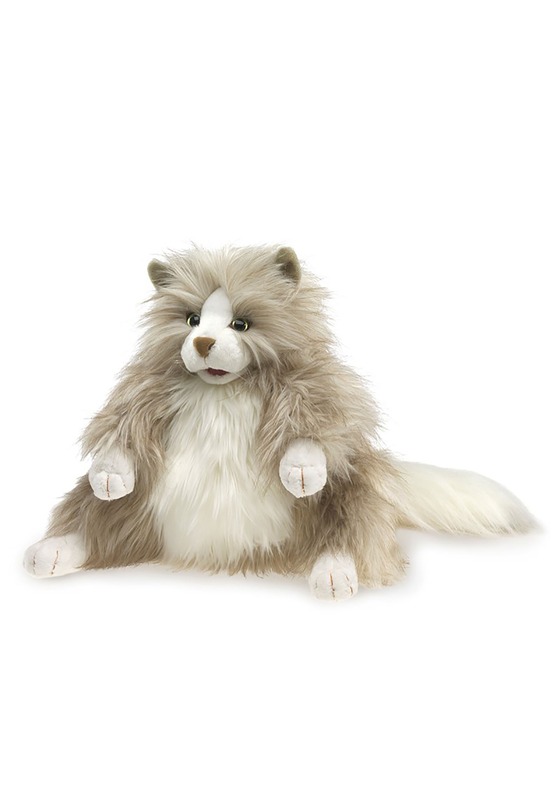 This cute little kitty is made by the Folkmanis puppet makers and he measures 12 inches tall. He's covered in a layer of gray and white faux fur. He has soft, plush features, pointy ears, and a pair of curious cat eyes! He has a small compartment on the bottom which fits your hand. You can control his movements and truly bring his character to life! You can choose any name for your fluffy kitty puppet! Perhaps you'd rather name your cat something like Kitty Harington or Wally Whiskerton? The options are limitless!